I had been asked by David and Miles from the Carp Society whether I and 3 other mates could test a new water they were going to open to anglers. 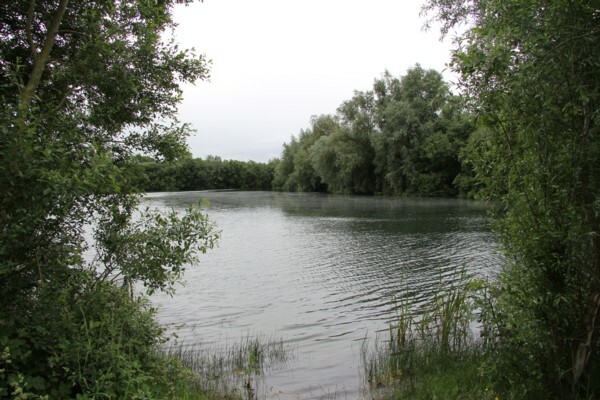 The water in question was next to Farriers lake in the Cotswold Water Park aptly called Little Farriers. The reason they invited me to test fish was to try and evaluate the tench fishing potential. A quick chat around with mates who had fished around the Water Park indicated that several years ago double figure tench had been coming out. Now this really whetted the appetite. 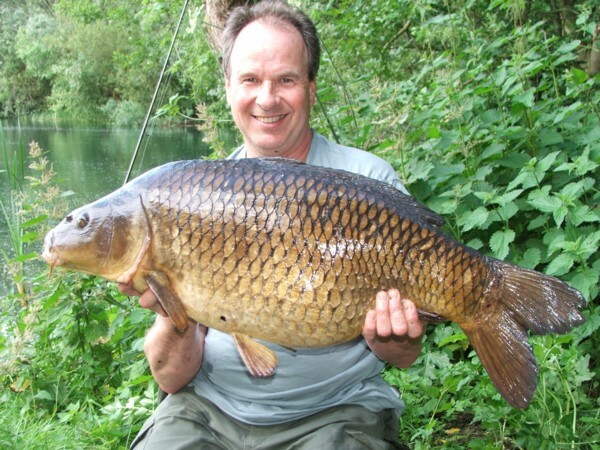 I chose Archie Pike, Paul Hawkins (fellow Tench Fisher members) and good mate Andy Cowley along for the 3 days session. Plans were made to meet with Miles on the morning so that he could show us around. Unfortunately the day before Archie had to drop out, however Dave Rogerson again a fellow Tench Fisher joined us for the day. We rendezvoused at 7am for a cooked breakfast before making the short 100m journey to the lakes car park. Leaving the cars we walked around the banks of Farriers Lake to a large wooden gate. This when opened revealed one of the most beautiful tree lines gravel pits you would ever want to see. Breath taking in truth. Miles showed us the swims (about 8), having said that it was not the well manicured gravel ones that are normal but grass covered banks of short grass. The path around the lake had been cut and tended by the hard working bailiffs and would accommodate a barrow full of tackle easily without losing the wildness and isolation. 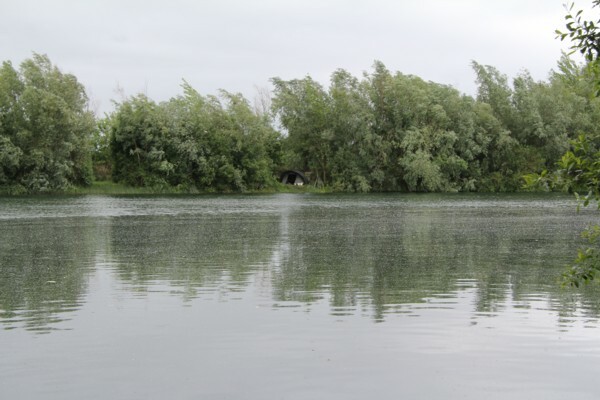 As we walked around the swims it was obvious that there were plenty of fish activity with carp leaping on the edge of the willow branches that draped into the water. Tench fizzed in many of the swims with the odd one rolling. Excitement and animated finger pointing at feeding tench and carp combined with our colorful language painted a perfect picture of the situation. Soon we were fair racing back to the cars for our equipment looking forward to the session. On passing one angler on Farriers lake we enquired whether he had any luck. 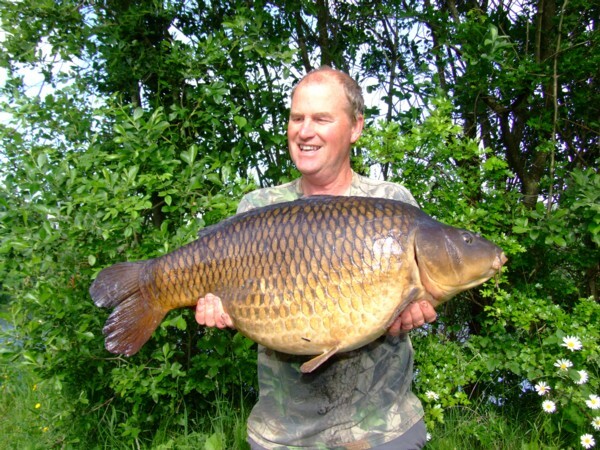 Well the carp gods were with him as he had a 39lb common. The walk from the car park is quite long and a barrow is definitely needed. This though is a bonus and does mean that when you reach the lake it is quite isolated. The weather was reasonably sunny with cloud coming in later in the evening and strong winds of 40-50mph gusts for the next two days. We all chose our swims and spread ourselves around the lake to enable us to view as much water as possible. The lake was said to hold plenty of weed however after feeling around with a lead I found a really nice gully that ran along the entire bank of the lake that was 6ft deep and practically weed free. This was about 12yds out perfect for float fishing for tench or carp. This was fringed with canadian pond weed as it shall-owed up on the near bank and further out as it shall-owed up to 4ft deep towards the middle. There was plenty of silk weed on the bottom which would be cleared by feeding fish once I had got some food and bait on there. I found two areas about 24 yds out that looked good and baited up with hemp, casters, dead maggots all items high on the menu for tench. Both area’s were soon were fizzing with tench activity and life looked sweet. The methods were the normal Drennan inline feeder and plastic maggots and a method feeder with fake casters on another. Again casting was only the 24yds and certainly you don’t need long casting here for sure. Miles returned after completing some jobs around Farriers Lake and watched me cast out. The area to my left was fizzing constantly and I waited for the alarm to sound. A second cast in with a method feeder and caster hookbait hit the spot. I was saying to Miles that with the short hooklinks it’s not often that carp are hooked. With that the alarm screeching into life it was obvious that something had been fooled into taking the hook bait. It was no tench that had taken the bait. The fight was not spectacular but on 2lb t/c rod had it bent quite well. Miles did the honours with the netting. I peered into the net and though I had a mid-double carp. We kept the fish safe while I got the camera scales and other equipment ready. It wasn’t until I lifted the net that I realised it was very much larger. Well, first fish of the session and what a beautiful common carp. We also had a good laugh at the short hoolinks and no carp statement. The fish continued to feed however getting them to pickup a bait was another. Andy arrived a little later then the rest of us and setup in a corner of the lake where there were a few carp feeding off the surface amongst the white calyx from the willow trees that surround the lake. Dave and Paul were struggling to get much action however they new it was only a matter of time. At 7.30pm I had another take on the maggot rod and landed a lovely tench of about 3lbs, not quite the specimen we were after but a welcomed sight. 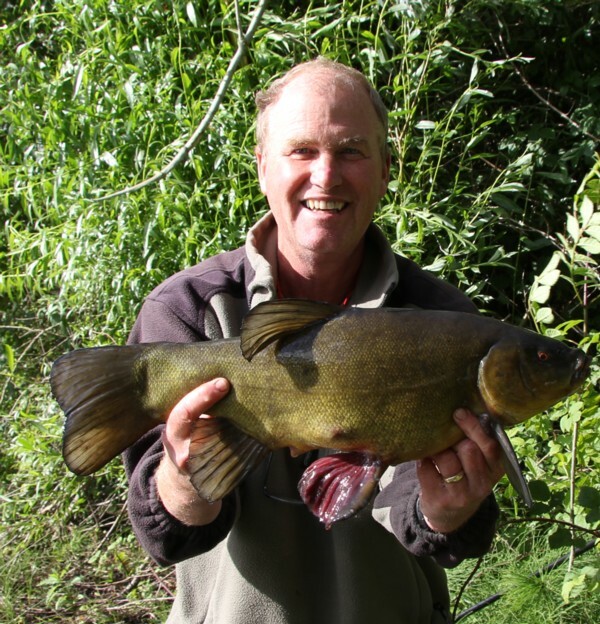 Dave was the next to join in when he caught a very dark looking tench of 5lbs 9oz. There are lots of small rudd that can be a nuisance on normal baits however plastic will last the hord’s attentions. Andy caught another carp off the top and a good looking 21lber. Dave had to leave at last light and he said what a privilege it was to fish there even if he only had one tench, just being there was enough. During the night I changed tactics to popup boilies on both rods and was rewarded at 1.50am with another common carp of 19lbs. First light came and I changed back to fake maggots and casters. The lakes surface was still covered in the white calyx and carp swam under it taking the odd gulp of a tasty morsel. 8am and I lost a good tench very close in to the canadian pond weed. Paul lost a very good tench of over 7lbs at the net. It was so close he could almost scoop it out once it threw the hook. The wind was gusting now and the willows above me creaked and grown-ed under full leaf and a strong summer blow. The lake though in parts was perfectly still with such protection from the surrounding willows. 10.30 came and another 3lb male tench came my way. The temperatures had practically halved and therefore I believe the tench stopped fizzing for a while. At noon I had a scale perfect 8oz rudd on the plastic maggot. Now it would be marvelous if these smaller rudd grew on to reach the magic 2lb mark in the future. I’m sure they will. At 4pm one of the rods was away again and I had a great fight from a lovely carp of 25lbs 4oz. 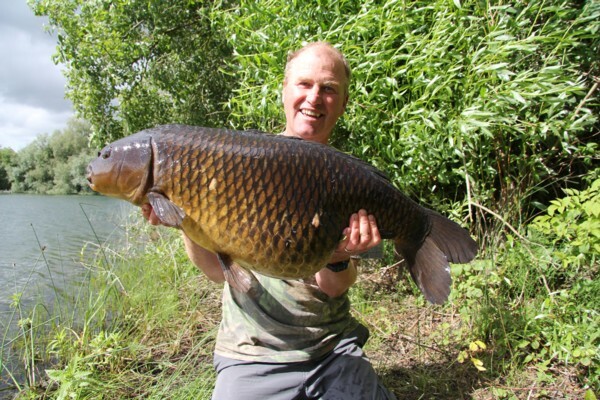 I don’t know but these big common carp are such beasts. Then one more tench came my way at 6pm. It fought really well and a sure sign that it was a male tench. It had unique red colour fins that is normal for this time of the year. the weight was 4lbs 14oz. 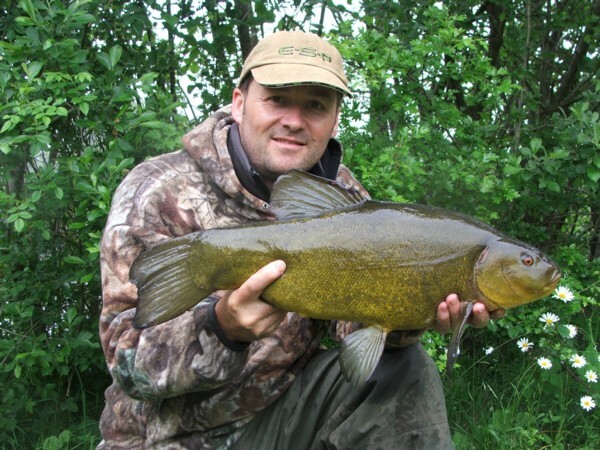 Andy by this time had no action on the tench front and decided to move into the one where Dave had caught his from. The night time passed quietly with a few carp rolling but still windy and a few showers too. This was to be my last few hours on the lake so I decided to see if the popups would work for the tench as Paul had unluckily lost a tench and a carp during the morning. So one rod was kept on this and the other changed to fake maggots again. At 6.30am the popup rod roared off and the carp powered off down the length of the lake and almost made the weed beds on the south end. I just managed to steer it clear and was bringing it up the nearside bank for several minutes and quite close when it got into a small weed bed and the hook fell out. Bugger! There was still some sporadic fizzing around the area where the boilie was cast once again. However the ripple on the lakes surface sometimes made it difficult to spot this. Then at 8.30am Paul came around to say he was taking some gear back to his car. Suddenly the alarm burst into life and I was down on the rods like a coiled spring playing a carp. The fight was not spectacular and some weed stuck around the back lead ended with Paul helping clearing this off. Paul did a great job in netting the fish. It looked like another 20lber. I kept the fish again safely in the net while I got all the equipment ready. Andy was opposite me looking on. As I tried to lift it out of the water onto the unhooking mat it felt really heavy. Once on the mat I realised it was huge, well huge for a none carp angler. On the scales it went 30lbs 8oz and scale perfect. I did a little jig and Andy came around to see it. He said it looked big when I lifted it out and the strain I had doing this. So that was it for me. I was on cloud 9 and couldn’t believe what a beautiful fish it was. I recast both rods and continued fishing until 11am when I had to pack up and leave. As I was leaving I gave Paul who had lost a few fish the tub of tuti-fruity popups to use. So that was it for me. It’s difficult to describe the lake other than to say it’s paradise found, once that gate opens and you take a few steps to the first swim and view the lake it’s love at first sight. 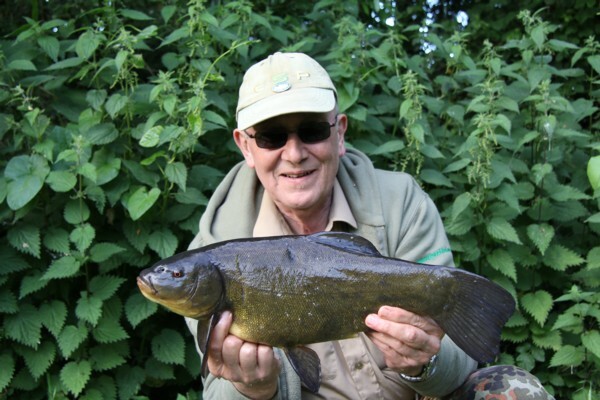 Paul continued to fish for tench using the popups and finally caught a couple of 7lb tench. 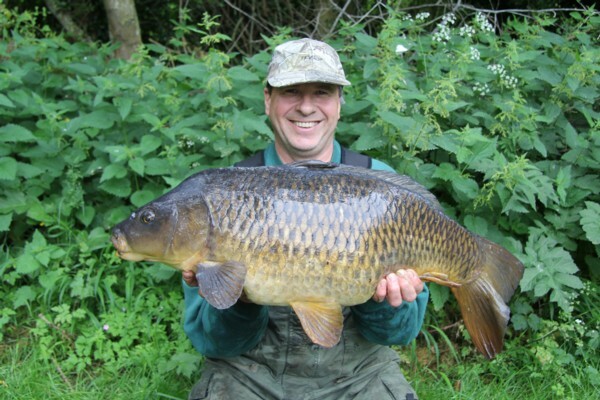 Andy caught 7 carp off the surface with the the 27lb 14oz common being the largest. He did catch a couple of smaller mirrors that fought like demons. I can’t say enough about this lake. I know others who have tested it have caught more carp and tench in spring however with all the richness of the lake about now I think we did pretty well. It’s not a runs water and will no doubt get a little more difficult to come. The tench potential is really good though and I will no doubt be guiding on the water sometime in the future. The beauty is the lake itself enchantingly intimate and you know you are not far from some very good fish. 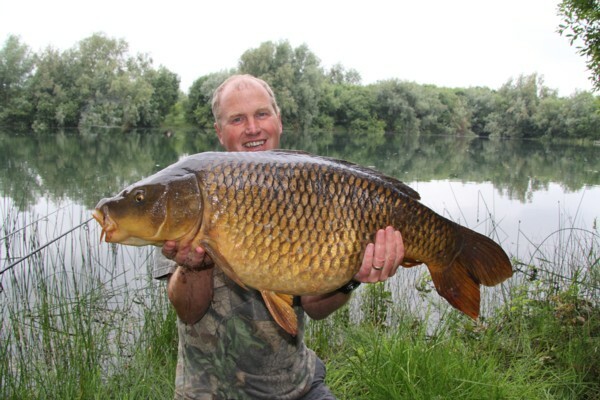 For all the information on the lake please contact the Carp Society or visit the website. Thanks David and Miles for an excellent and exciting experience. Good luck with the new adventure for the Society. This entry was posted on Thursday, June 27th, 2013 at 11:21 am	and is filed under Uncategorized. You can follow any responses to this entry through the RSS 2.0 feed. Both comments and pings are currently closed.